Kazakhstan is a country in the middle of Eurasia. Its official name is the Republic of Kazakhstan. Kazakhstan is the ninth biggest country in the world, and it is also the biggest landlocked country in the world. Before the end of the Soviet Union, it was called "Kazakh Soviet Socialist Republic". The president of the country from 1991 through March 2019 was Nursultan Nazarbayev. Nursultan is the capital city of Kazakhstan. Almaty was the capital until 1998, when it moved to Nursultan. The Kazakh language is the native language, but Russian has equal official status for all administrative and institutional purposes. Islam is the religion of about 70% of the population, with Christianity practiced by 26%; Russia leases (rents) the land for the Baikonur Cosmodrome (site of Russian spacecraft launches) from Kazakhstan. Kazakhstan is a transcontinental country mostly in Asia with a small western part across the Ural River in Europe. It has borders with the Russian Federation in the north and west, Turkmenistan, Uzbekistan and Tajikistan in the southwest, and China in the far east. The northern border is mostly with Siberia, Russia, so Russia has the longest border with Kazakhstan. Basically, Kazakhstan runs from the Caspian Sea in the west to the mainly Muslim Chinese autonomous region of Xinjiang. Kazakhstan has no ocean shoreline, but borders the Caspian Sea, which boats use to get to neighboring countries. The Caspian Sea is an Endorheic basin without connections to any ocean. Kazakhstan has plenty of petroleum, natural gas, and mining. It attracted over $40 billion in foreign investment since 1993 and accounts for some 57% of the nation's industrial output. According to some estimates, Kazakhstan has the second largest uranium, chromium, lead, and zinc reserves, the third largest manganese reserves, the fifth largest copper reserves, and ranks in the top ten for coal, iron, and gold. It is also an exporter of diamonds. Kazakhstan has the 11th largest proven reserves of both petroleum and natural gas. Kazakhstan is divided into 14 provinces. The provinces are divided into districts. Almaty and Astana cities have the status of State importance and are not in any province. Baikonur city has a special status because it is currently being leased to Russia with Baikonur cosmodrome until 2050. Each province is headed by an Akim (provincial governor) appointed by the president. Municipal Akims are appointed by province Akims. The Government of Kazakhstan moved its capital from Almaty to Astana on December 10, 1997. The population of Kazakhstan is 17,165,000. It takes the 62th place in the List of countries by population. Average density is one of the lowest on earth with almost 6 people/km2 ( List of countries by population density). ↑ "Численность населения Республики Казахстан по отдельным этносам на начало 2016 года". Archived from the original on 14 October 2017. Retrieved 24 May 2017. ↑ Schneider, Johann F.; Larsen, Knud S.; Krumov, Krum; Vazow, Grigorii (2013). Advances in International Psychology: Research Approaches and Personal Dispositions, Socialization Processes and Organizational Behavior. Kassel university press GmbH. p. 164. ISBN 978-3-86219-454-4. Archived from the original on 27 February 2018. ↑ Kazakhstan Archived 30 October 2017 at the Wayback Machine. CIA World Factbook. ↑ "Population". Retrieved 29 October 2018. ↑ 6.0 6.1 6.2 6.3 "Kazakhstan". International Monetary Fund. Archived from the original on 27 February 2018. ↑ "GINI index (World Bank estimate)". databank.worldbank.org. World Bank. Retrieved 3 February 2019. ↑ "2018 Human Development Report" (PDF). United Nations Development Programme. 2018. Archived (PDF) from the original on 19 March 2016. Retrieved 15 September 2018. ↑ The constitution of Kazakhstan, CONSTITUTION OF THE REPUBLIC OF KAZAKHSTAN: 1. The state language of the Republic of Kazakhstan shall be the Kazakh language. 2. In state institutions and local self-administrative bodies the Russian language shall be officially used on equal grounds along with the Kazakh language. ↑ "Afghanistan". CIA - The World Factbook. Retrieved 30 August 2011. ↑ International Crisis Group, 2007. Central Asia's Energy Risks, Asia Report No. 133 Archive copy at the Internet Archive. 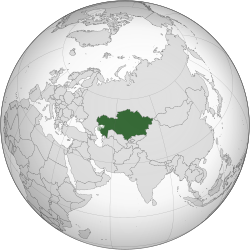 ↑ 14.0 14.1 CIA World Factbook: Kazakhstan. ↑ Kazakhstani includes all citizens, in contrast to Kazakh, which is the demonym for ethnic Kazakhs. Wikimedia Commons has media related to Kazakhstan.